With two months to go until the November 7th polling date for the 2010 Burmese national election, widespread evidence exists indicating that whatever pretense was made of a democratic process, its actual implementation within the election has fallen incredibly short. State Peace and Development Council (SPDC) forces have remained active in undermining the nascent democratic process with significant multi-faceted attempts to ensure the continuity of the current governments rule post November 7th. These efforts have targeted democratic and opposition forces through a variety of approaches designed to effectively overwhelm any opportunity for political engagement before the campaign period even began officially on August 31st. They include re-writing the constitution to bind the junta to the political system; legal entanglement and restriction; censorship; and the formation of government militias and thug groups1; the use of existing government funding, administration, police, military, and civilian action groups to campaign for government parties2; using state money to fund pro-government civilian parties; using coercion through rewards and threats in order to secure votes; While portions of these activities are actually written in to the legal framework for the lection, others violate the election laws written by the current ruling junta, technically requiring that the subsidiary pro-government parties involved be deregistered and disband. The two largest parties campaigning in the coming election share strong ties with the current regime. The Union Solidarity and Development Party (USDP) and in part, the NUP (National Unity Party), directly violate the rules of the current election through their efforts to buy votes, intimidate rival parties, use of state assets to undermine the democratic process, all underlining their connections with the current regime, the State Peace and Development Council (SPDC). 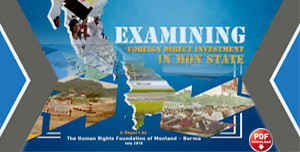 This report will detail the methods of these election abuses committed by the USDP and NUP, and subsequently the SPDC, throughout southern Burma. 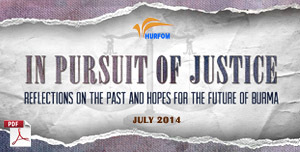 Accounts from politicians and civilians, and data gathered by HURFOM’s researches, illustrate the severity with which these parties have undermined the democratic process with the consent of the SPDC, and abused the legal structure of the current election period. Due to heightened security during this period, these accounts and data gathered by HURFOM’s field reporters is a sample of events and experiences that occur more widely throughout the region. The current efforts by the SPDC evolved from the failure of the government’s civilian parties in the 1989-1990 election period. Beginning as early as 2003 the SPDC government announced its plan to revisit the democratic process. Lt. General Khin Nyunt announced the “7 step road map to a disciplined democracy”, which, though containing no timeline, proposed several key steps of reconvening the national convention, drafting a new constitution, and holding elections for seats in the national legislature. In an effort to ensure regime’s future success, this map put in motion a process to significantly alter the conditions under which future elections would be held. The foundation for much of the widespread election criticism has resulted from the passage of the 2008 constitutional referendum. The text of the new constitution lays down rules that have had significant effects on the outcome and structure of the current election period. Elements of the document ban participants who are married to foreigners, and ban citizens who have committed crimes, both of which bar the head of the now disband National League for Democracy, Aung San Su Kyi. 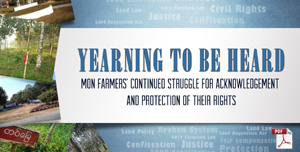 Additionally, 25% of all legislative seats for the upper and lower houses are given automatically to members of the military, and no part of the document guarantees the rights of ethnic minorities in Burma. Over the last year election laws have been announced that further solidify the governments control on the climate in which the election has unfolded. First announced in March the SPDC created the Union Election Commission that has since had a crucial hand in regulating party registration. Election law No.2/2010 requires all parties to register 1,000 members within 90 days of their formation, and has multiple lines banning anyone serving a prison term, anyone affiliated with a religious order, members of insurgent groups, foreigners, and current civil service personnel are banned from joining or funding a political party. On June 21st a 14 point directive was announce further restricting the capacity of fledgling parties from nearly all aspects of traditional campaigning, including bans on marching in groups, waving flags, chanting slogans or making negative comments about the current regime3. A the time of this reports writing, the last date for candidacy registration passed on August 30th, culling the final number of parties able to participate in the election to 42. Of the 42 parties that have registered and successfully submitted candidate lists for the election, the two with the largest number of candidates are the pro-government USDP and NUP. At the top of the list, the USDP and NUP are set to contest all seats – 1,139 – and nearly all seats – 800 – respectively. While candidates have only 2 months to officially campaign4, the manipulation and abuses of the election law practiced by USDP, NUP, and SPDC forces have already significantly undermined the efforts of every independent party. The accounts and data collected below evince the activity and connection between the USDP, NUP, and the SPDC through their use of state resources, intimidation of rival parties, rhetoric, vote buying, and manipulation, in the name of perpetuating the current regime’s rule. While in the past HURFOM’s reports have highlighted specific cases of government involvement in repeated census taking, intimidation, local militia creation, and extortion and bribery, the USDP and NUP party now play the most prominent role in election manipulation. Two of the independent ethnic parties registered in southern Burma noted here are the All Mon Region Democratic Party (AMRDP) and the Phalon-Sawaw Democratic Party (PSDP). Accounts from members of these independent parties have provided on-the-ground detail of their experiences in the campaign process, and indicate the sweeping disparity between the USDP, NUP, and their own independent parities both in resources and legal restrictions. Members of the AMRDP hold one of their regular meetings in Mon State, in June, 2010. The government chose November 7th [as the election day]. There are no problems for the party they support, the Union Solidarity and Development Party [USDP], but for the ethnic political parties, the non-ethnic political parties and the private political representatives, three months is a very small [time] to campaign in5. Besides campaigning, they are in a rush to prepare for the election. Moreover, I think the laws or orders which constrain the political parties should not exist during the election campaign. For instance, the party we support has to first inform the State Election Commission where they will go [to campaign]; when they will go [to campaign]; and how many people they will meet if they campaign. They have to ask permission one week in advance. Moreover, there are disappointing rules which never exist in the other countries such as ‘you cannot marching and campaign in the streets; you cannot assemble [publicly] in groups; you cannot use loudspeakers; you cannot print posters or pamphlets. If these actions are not allowed to be done at this time, is impossible for the election to be a free and fair…Not only the citizens who cast their votes but, like us, also party-members who want to run in the election will have been abused. Therefore, [the election] is not free and fair. The international communities who monitor the Burma’s affairs should know [about the current situation] and should stop [them]. A member of the AMRDP, Dr. Banyar Aung Moe, 64, who currently lives in Three Pagodas sub-township, Kawkarike District, explained to HURFOM’s reporter that within the current condition, citizens of Burma need more electoral knowledge, skills in political analysis, and “brave decisiveness”, to make the political parties able to compete against the USDP. He added that the other political parties do not get the rights to collect party-members and to campaign as the USDP does, (with independent parties being held to the 14 point directive, while USDP and NUP campaign action indicating they are not) a legal imbalance and violation that has become a growing weak point for these independent parties. He noted in an August 18th interview that the AMRDP has to inform the State Election Commission one week in advance when they want to conduct campaign activities in different regions, a restriction that significantly disadvantages the party in their campaign efforts. Now, the government has specified the election day, so [we] have clearly know what to do first. In my opinion, the hardship that every political party meets is that the Election Commission demanded the list of the names of 1,000 party-members which is due at the end of this month [September]. In this time, some parties have just been established. And then, [they] could face a lot of hardship because they are not like the Union Solidarity and Development Party [USDP] which is helped by the government in collecting members and have gotten support from the government. Another difficulty is time. The parties have very little time to organize the people in their particular constituency. Moreover, there are limitations, so [we] cannot do all of our work within two months. I don’t understand why [we] have only two weeks to choose Hluttaw representatives when free campaigning is banned. Another big hardship is that Hluttaw representatives have to guarantee [contesting the seat] with five hundred thousand [kyat]. Then there’s financial hardship. If we requested the money from the communities, we have to do it a lot [more then we want to]. Moreover, in my opinion, the civilians do not want to deal with politicians like us. I have been aware of [this situation] for a long time. I realize that is because fear dominates them. We shouldn’t blame them because they are taught by their experience to be afraid of (dealing with politicians) for twenty years. According to the situation, it is sure that we can’t do as we want. We have no alternative but to exploit the chance we got [through this election]. The ethnic civilian population, though the target of campaign efforts, has in many cases experienced the election period as one inundated with tactics of division by SPDC administrative and military personnel. Legally, areas have faced a multiplicity of parties, both secular and ethnic, that support the current regime, while few represent independent democratic or ethnic interests. Government administrators have frequently conducted censuses of the voting population of each household, data that has been documented to inform USDP activities. In addition, villagers have faced travel restrictions, motorbike seizers, spying, and arrests by military units in an apparent effort to keep village populations from being able to participate in election activities. Civilian responses have differed widely, though 80% of interviewees, by HURFOM’s estimate, see the election process as unfair due to the strong connection these pro-government parties exhibit with the ruling regime. Civilians interviewed by HURFOM have voiced concerns over the differentiation between independent parties and pro-government parties. In Karen State where four parties are registered to campaign, people voiced doubts over three parties that are closely related to the government. The four parties are the Union Solidarity and Development Party (USDP), the National Unity Party (NUP), Karen State Democracy and Development Party (KSDDP), and the Phalon-Sawaw Democratic Party (PSDP). that Union Solidarity and Development Party is the party of the ruling government which is [already] predicted as the winner of the election… The next one is National Unity Party which is led by a retired military staff member. As a retired military staff, he would not be free from the influence of them [SPDC]. The last one, the Phalon-Sawaw Democratic Party [PSDP], can be described as not related to the government. As a Karen national, it is compulsory to vote, [but] I don’t want to water the poison-tree. I will choose the party which is clear of them [SPDC influences]. Anyhow, I have studied [about the election] a little, so I can speak what I think. I dare say that 70% of the people in our Karen State know nothing about the coming election. When it is about time to vote, they(the government) will manage the know-nothing people as they like. The circumstance is very worrying. Therefore, the specific [independent] ethnic political parties needs to meet with [their] communities. In Karen State, we only like the Phalon-Sawaw Democratic Party [PSDP] because they have a clear background. [But] we don’t expect they will win [the election]. Because, as most people think, this election tends to continue their [SPDC] power, as they have already prepared to win [the election] thoroughly in all constituencies. The Union Solidarity and Development Party [USDP] has not only been strong in members and finance but also gotten favors [from the government] in the election campaign. The TaSaNya [National Unity Party, NUP] is directly related with Saw Aung Pwint, the president of Karen State Election Commission. He is a retired military staff member. We vote for the party we like but no one can guarantee that our votes won’t change into theirs [SPDC]. No one can monitor the situation. While the internationally [observers] will monitor [the election], [but] who will monitor the pole stations in the rural areas – our region. You can imagine. According to my friend who is working on pole station construction, there will be many pole stations. It is instructed to construct one pole station for every 300 voters. If it happened as we said, it is sure that the government will have managed [to ensure that] no one can monitor the pole stations. Therefore, as most people have said they [SDPC supported parties] will win [the election] any way. SPDC forces continue their direct involvement in preparations for the election through the collection of family lists and use of travel restrictions to undermine communication between villages and towns. The collection of family lists, particularly of residents over the voting age of 18, has continued for months prior to and even during the current campaign period6. These lists collected by government administration from the Village Peace and Development Councils (VPDCs) are later used by pro-government parties in targeting families to join parties and support their campaign, or to automatically enter eligible names to the party’s membership list. In addition, abuses that target villagers’ abilities to travel have also increased, with villagers being threatened with confiscation of motor bikes as well as increased travel restrictions outside of villages and around townships. It is likely that these seizers and restrictions are intended to limit the flow of information and the ability of opposition groups to campaign, as pro-government parties are able to by pass the restrictions by showing their party ID cards. In my area, many villagers have been giving their updated numbers of family members to the village headmen. I heard that the villages’ headmen were also receiving threats or pressure from the upper level7 officers and township authorities [locally known as Ma.Ya.Ka in Burmese]. I have memorized that there have been at least 15 times [when the] census was taken by village chiefs in the village. I think the updating of these censuses will be directly linked with the election. They are going to identify how many voters for their government’s party are in this area. My relatives living near Thanbyuzayat told me that over the last 3 days the local authorities also have been trying to collect family lists and census in the areas again and again. They started threatening the local residents, such as seizing their motorbikes in the area. More travel restrictions have been occurring in my area. The situation is becoming worse now. The local authorities are trying to collect family lists and census in the areas. [Also] they started threaten the local resident with arresting motorbike drivers in the area [and seizing the bikes]. As I know, this constitution has not got much real support from the residents. But the government will certainly try to win in coming election. I think, finally if they can’t get the residents involved in the election, they will point their guns [at us] to get votes from us. The government set up more troops [and toll gates] along the highway road. But I don’t know what the reason is for. Sometimes the troops force me to buy dry cell battery. As I think, [this is] for the election. Even though we have our ethnic parties; ultimately those people must following the SPDC constitution and road map. The situation will not become better because everything is done by the Military government…Especially in a rural area like this, it is not like he urban area. Because in this area people have especially low education, so people may not know how to disagree with the government if they want to. So even if people would like to boycott they have no idea how to boycott and also there is no leadership to make [for] them an open-minded chance. My opinion is then that people are losing their way [in what they want to do]. In this case people in rural areas really need education in how to participate in the elections. People seem to get involved if they have enough confidence, this is my opinion. To make sure how good or bad the government is, if [we] look back at their history in the country, if this government has been practicing self-interested work, these groups of people, we cannot call a good government – the same thing as [an] individual; we have to look back at his history. If it is not as good as what we think or expect, he or she will not be a good representative. This is my view on the current government authorities. I have to attend meetings in LIB [Light Infantry Battalion] No. 106, especially with the tactical commander, every Friday, regarding local security, by myself. Asking about to make sure if the people have their ID card or not, updating the family lists very often and increasing the security of the villages – I have to report [this information] back to the local authorities every week – this is the activity they require of me. The government announced [they will] seize the motorbikes without licenses. At the movement I don’t hear about the people who have been lost their motorbikes. But it is frequently happening and we must be careful when we drive our bikes. Now, I keep it in my house, I don’t let my children use it. I don’t think this coming election is fair. The government tries to place their people in to these positions [elected positions]. They do not really care if the residents agree with them. If they do not get [success in the election] by the soft tactics, they will use hard tactics. Our plight is constant suffering. The success of the USDP and NUP in campaigning has been overwhelmingly contingent on the use of government support. Financial support is provided to open offices and bribe residents with gifts; the two parties are apparently granted the ability to exert direct control over local administrators, police, and military personal; the USDP retains its enmeshed relationship with the government run civilian action group, the Union Solidarity and Development Association (USDA); and the support of the government and use of coercion against opposition voters is considered tactical in USDP election documents. These abuses have demonstrated extensive links between the USDP and NUP, which under SPDC election law, should lead to the de-registration and abolition of these parties8. A stark violation of election law is the power the USDP and NUP holds over government administrators in village and township offices, as well as over soldiers in local battalions. USDP and NUP officials are able to arrange for VPDC and TPDC headmen to gather villagers for events and office openings, and force residents to join the parties to bolster their ranks. Additionally, though not yet elected, USDP and NUP campaigns guarantee party members that they will be exempt from all of the common harassments and abuses carried about by SPDC administrators and military personnel, a clear indicator of the sway parties have over the current regime’s personnel. 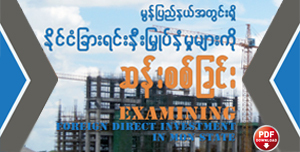 Not only is this confirmed by accounts from residents and members, but also through official party documents obtained by HURFOM indicating support by the government for the USDP is officially acknowledged and sanctioned. The USDP has also directly violated election rules by pressuring village headman who are administrators for the current regime, to gather residents to join their party. This violates not only laws concerning parties making use of current government administration in its campaigns, but also in coercing or manipulating residents into joining the party. On August 20th, the USDP officially opened offices nation wide. In Ye Township the USDP held a celebration to mark the event. Locals who had attended the opening ceremony said that 30 persons per village in 22 villages in rural areas (outside of Ye town) were forced to attend the ceremony by the heads of each village peace and development council (VPDC) by order of the chairman of the Ye Township peace and development council (TPDC). We have to come [to Ye town] for two days in advance for their [USDP’s] Ye office opening ceremony. Our village headman said that if we did not go, our village’s development would be delayed and we would lose our benefits, so we had to join. The persons who have to attend the ceremony were selected. The intellectual women and youths who have education were selected [to attend the ceremony]. And then, the persons who are already members of USDP were mainly collected. As I know it, 30 persons per village were collected in order to make the ceremony splendid. Anyhow, I lost my time. We don’t want to deal with the political parties. However, we know that in the current situation, USDP has a lot of members and power, and if they win in the coming election, they will become the new government. Our village headman doesn’t want [our village] to be punished [by the new government] because of refusing their order. Therefore, we were forced to go. When we arrived there, their party office opened at 9 am on the 20th[of August] – we wore Mon dress, clapped our hands, were videoed and photographed and then went back. According to my friend (currently a clerk at the VPDC), every village had to send 30 USDP members in order to get a show of strength (in the USDP office opening ceremony). The rural villagers were forced to attend [the ceremony] by the orders of the TPDC. I think our Lamine [area] had over 50 attendances. Their [USDP] members equaled over 30 persons [from the 50 Lamine area residents]. They were ordered to show their strength in bulk. I think they want to depress their rivals – NMSP [New Mon State Party], and National Unity Party [NUP]. This is the way they usually use [members]. The winner will be them [the USDP]. On every issue, they can order the civilians [do what they want]. The civilians daren’t complaint. The complainers will be jailed. An election educator from the KNU leads a class on the 2010 election during June, in eastern Ye Township, Mon State. According to information given to HURFOM’s field reporter, persons who are responsible for USDP activities in Ye town are: U Tun Myint (the owner of Shwe Taung Kyar restaurant), U Tun Myint, U Hla Win(Zee Phyu Taung village), U Maung Myint(Asin village headman) and U Mae Tone(Yan Kyi Aung Township, Ye). These people compose a 5-member committee and lead the USDP’s office opening ceremony. The ceremony agenda included declarations of the office opening by the committee leaders; and exhortations that party members must to strive to win in the 2010 election by the support of civilians. Notably the ceremony was closed with the proclamations of “Three Statements of Our Duties” – a SPDC motto that urges citizens to protect the state, unite all ethnic minorities with country, and restore Law and order in the country. Between August 8th and 11th, key members from Mudon Town USDP visited village headman from Mudon Township, requesting that they organize 40 to 50 villagers in each villages in the whole township, to join and support their USDP party. It seems to me that a very few numbers of the Mon populations will be interested and join this government supported party. My village chief is also confused about their [USDP] demands for organizing the Mon villagers in my [Taung Pa] village. Even though the state’s run television and radio are saying “to be free and fair upcoming election”, I would say since the beginning of these organizing periods, they have been breaking what they said was a ‘free and fair’ issues already. I am not interested in the USDP because they were using the power of the current government to organize their supporters amongst the ethnic Mon and Karen communities. I don’t believe that this tactic is going to work and this action is totally against the election rules. Now we only think for the Mon party [AMRDP] to get more votes and for [them to] win in the election. So we will join the Mon party. On the 17th and 18th of August, the National Unity Party (NUP), worked to organize 50 people from each Mon village in southern and northern Ye Township, Mon State, to cast votes in favor of NUP party candidates and issued permanent member cards to those people from each Mon village. U Hla Maung, 45, who is chairperson of the NUP, has been organizing at the local level, with campaign messages highlighting the guaranteed changes the NUP can make, and that they want to support Mon ethnicity. At a community speech on August 17th, U Hla Maung was quoted by a HURFOM researcher who attended the event, as saying, “Our party will work hard for Mon people”. U Hla Maung is one of the 800 candidates fielded by the NUP. According to what U Hla Maung said, as a holder of an NUP party member card, you will not be stopped by traffic police officers while travelling in Ye Township, none of your family member have to go for Loh Ah Pay [forced labor] while other people have to go for it, and you also do not need to worry about taxation charged by the army. If the villagers from these villages become party members and vote for NUP, they do not need to worry about motorbike confiscation, taxation charges, and Loh Ah Pay work [forced labor], so said the key party members through their campaign activities. Through the campaign, the key party members have new members join, but I cannot estimate how many new members they get. I do know, however, that the NUP is the party at one time formed by General Ne Win. Because this party was once formed by Gen. Ne Win, even though [it says it will] give equal rights, for me, I do not believe in it. The people who do not think like what I think will regret it later on after becoming its [NUP] members. We are the ones who have to write our history. And although prisoners may escape from prisons, it is not considered that they are free. By thinking deeply, no one [should] want to vote in this forthcoming election. In my opinion, the citizens can vote for the party that they want to. No one can prevent them from [voting for] which party they want to vote. Persuading people to vote for the party is like how other military regime ruled countries held the election. Apparently, this is called vote-buying. We [our party members] will not do like that. We believe our people. We’ve already known what our people’s real attitude is, and then we will serve our duty for our people fairly. There is no need to be doubtful [about that] the government supports this political party in many ways. We can know exactly whether it is right or not when we hear of what they [NUP party members] promise to do. Without any support from the government, they [NUP party members] can’t guarantee that there will be no more Lok Ah Pay [forced labor], motorbike confiscations, and taxation charges. The USDP seriously wants members from the civilians who are over 18 because they cannot recruit the government employees as their party members according to the election rules. 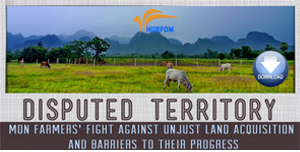 Currently they are still organizing in the rural areas in most part of the Mon State. Central to the campaigning process of the USDP has been near indistinguishable link to its predecessor and parent organization, the USDA. The USDA, which holds Snr. General Than Swhe as its patron, has financial backing of the SPDC, and an estimated 30 million members, has appeared to put all of its resources behind campaigning for and raising the image of the USDP. This includes the significant funds the USDA posses being placed directly under the power of the USDP, to use for campaign financing and bribery of potential voters. I know that nearly 80% of the youth in my village have USDA members ID cards. No matter if the villagers are willing to join the USDA or not, the USDA township members put the villagers’ names in their members’ lists. This process has been implemented by the USDA members over the past 5 years already. Currently, they put the names of those USDA memberships into the USDP members [lists]. Thus, when they counted the USDP members in each township, the USDP has huge membership compared to other political parties like the NUP or AMRDP. However, currently, it seems to me that most villagers are not happy with the activities of USDP and not very interested in supporting the USDP. In two official documents obtained by HURFOM, USDP officials clearly indicate their working relationship with the current regime and the USDA10. Two USDP campaign tactics manuals for Jaygsachie an Myawaddie Townships, contain passages reading, “With the assistance of the state we believe that we are going to win in this election again [referring to victory in 2008 constitutional referendum].” And, “Most of the civil servants may follow the upper level instruction to vote for the USDP, however some civil servants may be influenced by the other opposition level parties if their education level is lower”. These documents, written only for USDP membership, illustrate that the support of the current regime is well known, and that pressure against opposition voters are elements of the party’s election campaign. Recruit 4 members per ward, in wards 1, 2, 3 and 4 of Three Pagodas town, and to organize civilians by intimidating them or giving them privileges in order reinforce and increase membership. If the rival parties are encountered in their campaigns, disturb them various ways. Polling stations are to be arranged in TP town in each ward in the following ways: 8 polling stations in Ward 1, 8 polling stations in Ward 2, 12 polling stations in Ward 3, 8 polling stations in Ward 4. 8 polling station workers (with an officer) must be appointed per polling station . Workers and officer must be key USDP supporters. Village Peace and Development Council (who are also USDA members) must encourage close associates and family to join. Civilians and merchants should be given privileges or intimidated in to joining. In particular, U Cho Lay, a USDA member in town, has been active in organizing amongst merchants in town. If you are a member of USDA, a member card is given to you. Those holding the USDA member card can pass the check points of the government without any checking. Non- members will meet difficulties at the governmental checkpoints while traveling and trading commodity. This can be told to recruit [the civilians] by telling them the privilege and the threat together. The family and relatives of a governmental staff must support only the USDP. If (they) supported the other parties, the particular staffs have to resign from his/her position and lose his/her benefits. Despite 20 years in waiting, the current election appears to be little more democratic than if the regime had continued to remain in power as the SDPC junta. Opposition party members, observers, and civilians alike have experienced confusion, harassment, pressure, leading to their understanding that the current election is unfairly stacked in favor of the current regime. 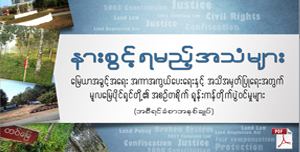 This belief is upheld by evidence indicating efforts by the regime and its two primary parties, the USDP and NUP, to pressure communities through giving benefits, and threatening opposition forces, to persevere. The SPDC continues to actively conduct supposed census campaigns and pressure communities with movement restrictions even into the election when travel and the flow information is most crucial to the election process. 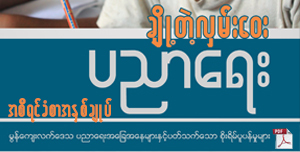 The USDP and NUP election campaigns hold an indisputable link with the current regime through the demonstration of their control over regime resources and personnel as if they had already won the election, the USDP’s direct support from the government’s USDA, and even includes support from the government and USDA, and intimidation of opposition voters as elements of campaign tactics. Apart from the immediate impact of a lack of democratic contest in the current election, longer-term threats exist in the form of institutionalized corruption of the democratic process. By legitimizing a system in which people are inadvertently awarded as the democratic system is undermined, the possibility exists that without efforts to raise communities knowledge and vocabulary of democratic knowledge, a precedent could be set that even further roots corruption and manipulation into the next political contest 5 years12 from now. 1 Further information on these pre-election abuses are detailed in HURFOM’s November 2009, December 2009 and January 2010 reports focusing on government election preparations. 3 “Junta poll watchdog bans party marches, slogans,”Mizzima June 24, 2010. 4 Horsey, June 2010; “Overview of Registered Political Parties in Myanmar”Conflict Prevention and Peace ForumJune 15,2010. 5 Interviewed conducted in late July ago when parties at that time still had 3 months to prepare. 6 Further information on these pre-election abuses are detailed in HURFOM’s, December 2009 and January 2010 reports focusing on government election preparations. 7 Likely to be referring to Infantry Battalion No. 62 or Artillery Regiment No. 315. 8 Election Commission Law Chapter III 12(a/(V)) requiring the de-registration of a party that has directly or indirectly used resources owned by the state. 9 A reporter from the Independent Mon News Agency (IMNA) collected this information during the 2nd week of August. 10 While details of the tactics manuals cannot be included for security purposes, copies of the manuals are available on request. 11 An English language version of the notes is available on request. The sampled notes have been summarized and re-formatted to fit the purposes of this report. Horsey, June 2010; “Overview of Registered Political Parties in Myanmar”Conflict Prevention and Peace Forum June 15, 2010.